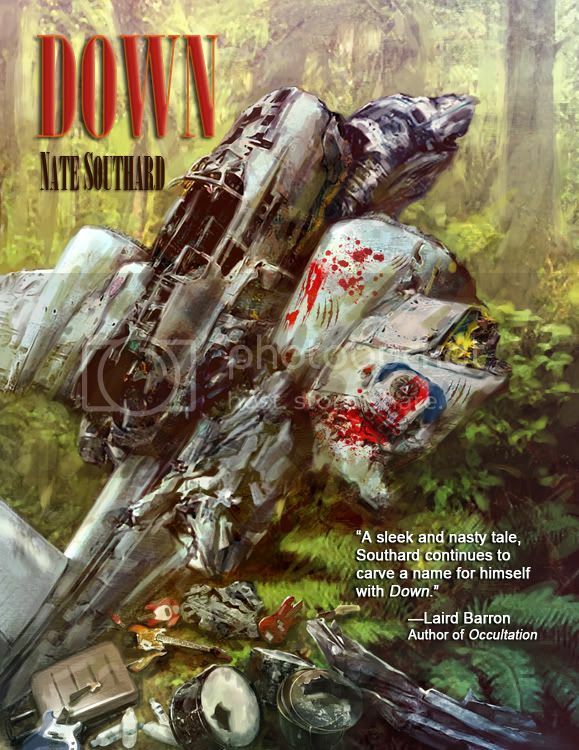 Hopefully, you know my next novel, Down, is available in early June.Â But did you know you can read the first chapter of the book NOW?Â Well, you can! In 1992, The Frequency Brothers board a plane following a sold out concert in Austin, Texas.Â The plan is to fly to New York to shoot their next video. But then their plane goes down. Injured and stranded in a seemingly endless forest, The Frequency Brothers now find themselves fighting for survival.Â Everywhere they look, they see signs that they are not alone, that something waits in the darkness.Â They can hear it, and it sounds angry. Thereâ€™s something else out there, though.Â Something much worse.Â And it wants to drag them Down. Down is my next novel, set to be released in June by Sinister Grin press.Â Of all my novels to date, this one has spent the most time being carved, whittled, and banged into shape.Â I think it shows, too.Â Few things I’ve written have ever read as well, in my eyes.Â I’m very proud of Down, and I’m glad you’ll be able to grab a copy of the trade paperback soon. So keep your eyes peeled for more info over the next week or so.Â Full of friendship, desperation, betrayal, heroin, cannibalism, strange symbols, ominous sink holes, and something very large and very scary, Down is something I really think you’ll enjoy. May 4th through the 6th, I was in Indianapolis for Mo*Con.Â Founded and organised by Maurice Broaddus, Mo*Con is a convention that looks at genre fiction through the lens of spiritual, gender, and race issues.Â Instead of panels about vampires or selling your first novel, you get discussions of how your spirituality affects your writing.Â For an atheist who’s never considered himself very insightful, it was a little intimidating. It was also the best convention I’ve ever attended. Held in a church basement, Mo*Con is a pretty intimate gathering.Â I’ll admit I was a little nervous about that, because crowds of people tend to scare the living hell out of me.Â At your typical convention, I’ll spend about half the day hiding in my room, psyching myself up to go talk to people again.Â Maurice knew this and was sure to tell me where there was a room I could go to hide.Â Surprisingly, I never needed it, as I felt perfectly at ease all weekend.Â The folks at Mo*Con are that welcoming. After a brief opening ceremonies, we were treated to a performace by author and puppeteer Mary Robinette Kowal, followed by a presentation regarding puppetry and its ties to writing fiction.Â It was fascinating, easily the most informative panel I’ve ever seen.Â Her Saturday presentation on public speaking and readings was just as good, and the two presentations really inspired me to up my game both writing and reading-wise. Maurice was joined by Chesya Burke and John Edward Lawson for a discussion of race and genre that was both informative and (I’ll be honest) eye-opening.Â I always strive to make my characters real and true to their roots, and this discussion really highlighted some areas where my knowledge is lacking.Â Later that night, Mary Robinette Kowal read the first chapter of her current work in progress to get feedback on it, prompting another discussion of race in genre.Â The discussion was so intelligent it had Mary Sangiovanni and I talking about how we just write monster stories and feel a little dumb around such thought-provoking matters. Saturday afternoon, I served on a panel with Sangiovanni, Gary Braunbeck, and Tim Waggoner on spirituality and how it informs our fiction.Â As the only atheist on the panel, I worked hard to be as inoffensive as possible (this is difficult for me, because I uusually just say anything that appears in my head), and I think I was successful.Â I might have been a little too honest with the crowd here or there, but it was a great discussion, all around.Â I always enjoy hearing others’ perspectives, and this was no different.Â By the end of the panel, I was shocked to find that my reasons for being an atheist are the same reasons some others believe.Â A little strange, but very thought-provoking. There’s a lot more I could say–how the food was amazing and the late night disucssions in Maurice’s garage kept us in stitches–but I guess I just did say those things.Â A sincere thanks to Maurice for inviting and hosting me, the Indiana Horror Writers for all their help with the convention, and Rodney for driving me around all weekend.Â I really hope I can make it out next year.